IQAir begin in 1963. The first "IQ air purifiers" were filters for coal burning stoves. They helped reduce black dust build up on the walls close to stoves. Now we have the IQAir Healthpro air purifier and the IQAir Healthpro plus air purifier. This company has come a long way since its humble beginnings. IQ Air founder Manfred Hammed realized his asthma was not as bad in the winter. He thought it was because he was using this new filter for his stove. He wasn't alone other users also noticed they had fewer asthma attacks. IQAir air purifiers were just getting started. They begin to make filters for other things. In the 1990's they begin to dabble in the home air purifier market. They knew that large commercial air cleaners are very effective, but room purifiers were not. Their new goal was to create high quality to room air cleaners. It took 4 years of research and trials. In 1998 the IQAir Healthpro Plus air purifier was released in Europe. Later they released the IQAir Healthpro air purifier. It was put through a rigorous set of tests. It outperformed all of the other purifiers tested. It was named the best air purifier by the Stiftung Warentest, Europe's top product testing organization. IQair air purifiers made their way to American shores in 2000. They were an instant hit with allergy and asthma suffers. In the years since then IQAir, has released several new models of room air purifiers. These purifiers have received top rating from Consumer Digest Magazine, Allergy Buyer's Club, and Consumer Search, just to name a few. So What Makes Them Special? IQ Air purifiers use a HyperHEPA filter. This filters boast of superior airborne particle removal. A normal HEPA filter will filter out particles 0.3 microns and larger. These filters can remove particles down to 0.003 microns with a 99.95% efficiency. This is 100 times smaller than other air purifiers can filter out. This is also 10 times smaller than a virus. These air purifiers also are designed to be quiet. The air purifier is doubled walled to reduce noise. The fan is located in the center between the filters to provide more sound dampening. The motor is also supported on rubber suspension pads to reduce vibration sounds. Are Programmable with a day and night timer. Filter indicator light that forecast filter life based on actual usage. IQ air has many different models of air purifiers. 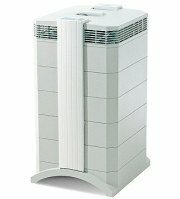 They have room air purifiers, whole house air purifiers, and commercial air purifiers. The four most popular air purifiers are below. The Healthpro Plus is the best selling model. It does a great job of filtering out most all of the airborne particles. If you have allergies or asthma, this is a good choice for you. It doesn't matter what your filtering needs are. IQ Air purifiers are able to give you clean and safe air to breathe. The Healthpro is the same air purifier as the Healthpro Plus. It is just smaller. You get all the same efficiency in a smaller package. This air purifier removes airborne allergens from the air. This purifier is the same size as the Healthpro. It works great for people with just allergies. It does not do as good a job with chemicals. Concerned about the chemicals in the air? This is the answer. This purifier is designed to filter out all the chemicals in the air. This will also provide superior odor removal.